Play Based Learning in Australia is sharing a poster that captures the play manifesto of its children; how awesome! 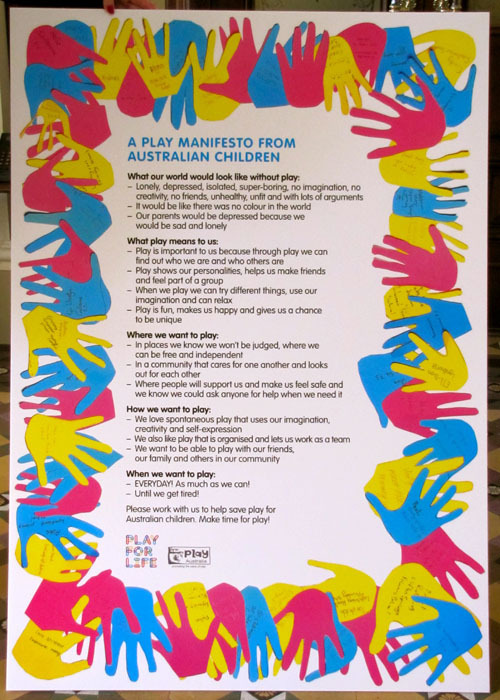 After the overwhelming reaction to the success of the Australian Children’s Play Summit held in Melbourne on May 17th and 18th 2012 Play for Life Australia is kindly making available a copy of the Play Manifesto created BY Australian children FOR Australian children as a download. Play for Life believes that if we put the future of PLAY back into the hands of Australia’s children, then PLAY will be in very good hands! Visit the original site for the full size poster.